Well if you are a Queensÿche fan then you are well aware of the nastiness that has happened over the last few years. If you aren’t, well let me give you a cliffnotes version of what has taken place. The four non Geoff Tate members got together and fired Geoff’s relatives including his wife (the band manager) and stepdaughter (who ran the fan club). As you can imagine this infuriated Geoff and in turn he lashed out at the band members most specifically Rockenfield and Wilton. During a concert in Brazil Geoff threw over the drum set and spit on Rockenfield and Wilton. Both Geoff and the other remaining members used the name Queensrÿche to release different albums that came out within a few months of each other during a time when they were both fighting for the name rights. Eventually the dispute was settled and Geoff sold the name to the remaining members of the band and he retained the full rights to the concept albums Operation Mindcrime I and II. Fast-forward to this year and both Tate and Queensrÿche are back with new albums to compete with one another again releasing them only weeks apart (2 to be exact in this case). So how do they stack up against one another? Lets review. I will start with Operation Mindcrime The Key. It is the first album in what is supposed to be a trilogy of concept albums. The music is very much like what later day Queensrÿche with Geoff Tate is like. If you like American Soldier, Dedicated to Chaos or Geoff’s recent solo work then you will want to pick this up. It is less heavy than what you would expect from early Queensrÿche and has a more pop rock feel to it with some occasional hints of Nine Inch Nails (Life or Death and The Stranger) thrown in for good measure. There are some reminders of old Queensrÿche but there more pop orientated sound. Burn in particular reminds me a little of Last Time In Paris. Geoff really stays in his lower vocal range during almost all of this album which leads me to believe he may not have that unbelievable range he once had. It definitely would make sense considering some of the most recent live performances I have seen and heard from him. Overall it is a solid effort but I find it falls a little short of something I would call great. The sound quality overall is a little muddy and I feel could have benefitted from better EQ especially a little more treble which is something I don’t normally say about newer recordings but definitely holds true here. Now, on to Condition Hüman by Queensrÿche, A definitely different sounding album than The Key. This is very similar to the last self titled release by the band minus Geoff and is very reminiscent of early Queensrÿche. If you are looking to relive the earlier days of the band this would be a good album to pick up. The new singer Todd La Torre definitely helps in restoring the old sound. He sounds very much like early Geoff Tate except on the very high notes there is a little differentiation. It seems fairly obvious by listening to this and the previous album that Geoff was very much in control of the creative process of the band and may give some great insight as to why they decided to fire his family and him from the band. It is an interesting listen But I sometimes have a hard time deciding whether they are trying too hard to recapture the old days or are actually doing it. Guardian as an example to me sounds a little forced in this sense. With the lyric Revolution Calling being repeatedly used in the song it just comes across a little contrived but overall it isn’t a bad song. Some songs seem to just plod along to me (like Hellfire) and don’t go anywhere but there are some that shine also and they seem to outnumber the plodding songs here. Some nice harmonies both in vocals and guitars here really give it an Operation Mindcrime (album not band) feel to it. Sound quality is just okay on this and definitely lessened the experience a little bit. Things sounded a bit congested and at times it was hard to really concentrate on single instruments when you wanted to (like during solos as an example). Overall it is a strong effort and very much a throwback to their earlier sound. It doesn’t quite hit the quality level of their pre Empire days but that would be a very hard thing to pull off given the loss of two very important songwriters from that time (Degarmo and Tate). So having spewed my opinions of the two albums how do they compare? Which one is better? It is very hard to really judge which one is better because they are such different albums even though they both have elements that are reminiscent of the earlier works of the band. If I had to choose which one I like better I would definitely say I prefer Condition Hüman. It is the better of the two but not by much. Neither one are great albums but Queensrÿche comes the closest and makes me happy. It definitely gives me my fix for new Heavy Metal music where Geoff’s effort is a little more forgettable to me.If you like the post Empire Queensrÿche over pre Empire than your opinion will be different than mine but judging from the sales of those albums I would guess that would be a small minority of Queensrÿche fans. 27-year-old Texas native Kacey Musgraves burst onto the scene back in 2013 with her Grammy award winning debut album Same Trailer Different Park. It was fresh and very progressive lyrically for country music including songs about gay rights and smoking weed (although that isn’t all that progressive, just ask Willie Nelson). It spawned two very successful singles in Merry Go ‘Round and Follow Your Arrow. She won Grammys for Country Album of the year and Country Song of the Year for Merry Go ‘Round. Rolling Stone named Follow Your Arrow the 39th best Country song of all time and it also won Song Of The Year honors at the 2014 Country Music Awards. Making a follow up to such a successful album would be a very tall order. With Pageant Material we get 14 new tracks including the last track, which is a duet with Willie Nelson that a hidden at the end of track 13. So how does it stack up against her debut? Quite well I must say. Kacey is one of the most talented lyricists I have ever heard and she doesn’t disappoint on this album either. Well written and well crafted country songs seem to just come easy for her as she has written quality lyrics to go along with the music co written by Luke Laird, Shane McAnally, Brandy Clark, Josh Osbourne, Natalie Hemby and Ashley Arrison. There really aren’t any bad songs on the album but the standout tracks are probably the first two singles on the album, Biscuits and Family Is Family. Don’t think that you have heard all the great tracks if you have already heard those two though, this is chock full of greatness. There aren’t any really controversial lyrics on this album like there were on her first album and I suppose that might be a letdown for some but not for me. The lyrics are just so well written and she is just an amazing storyteller she really doesn’t need to always push the boundaries with the content. 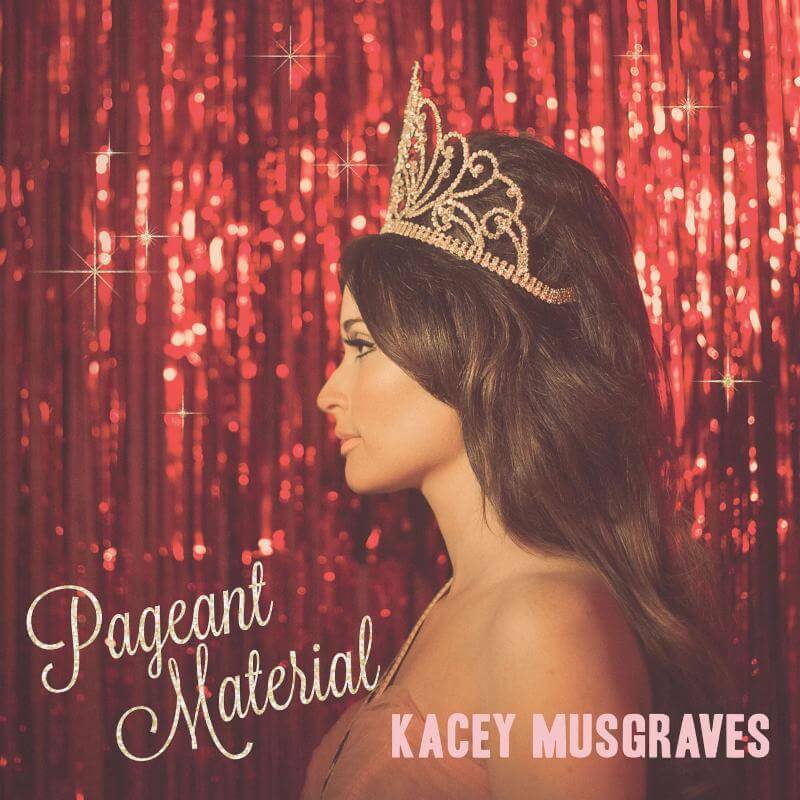 Whether its songs about minding your biscuits or dealing with what you were dealt with for a family or the fact that she will never win a pageant any time soon the lyrics and music are engaging and help keep you interested in what she has to say. In terms of audio quality it is pretty decent for a contemporary recording and mastering. It isn’t as dynamic as something from say the 70s or the 80s but it isn’t completely squashed either. There is decent separation between instruments and vocals with the acoustic guitar off slightly to the left on some songs and panned harder for others and the slide guitar off to the right. Drums and vocals are in the center with the snare slightly off center to the left. It isn’t mixed or mastered overly bright and the bass is decent but not over the top. I personally would have liked a little more bass but it isn’t bass shy by any means. With the extreme talent that Kacey has I can see her making great albums like this and her debut for several more years to come. There is no reason why this dime store cowgirl won’t be a superstar and selling out arenas if she keeps making masterpieces like this. Best version to get:Having listened to both the vinyl and the CD I would say get the CD. The vinyl has good sound quality and not many cracks and pops but the awful non-fill surface noise makes it very hard to recommend. It was pressed at United in Nashville which explains the noise, pretty typical United pressing. I tried two copies and had the same results so it wasn’t just a fluke. The vinyl is cool in that it is pink marble colored but that is where the coolness ends. They don’t even include the liner notes and pictures that the CD includes. No inner picture sleeve, nothing. It really feels like it was an afterthought. Like, hey vinyl is popular now lets put the album out on record and make it pink because colored vinyl sells even more. Stick with the CD ladies and gentleman you will be happier with it. In this day of side projects it can be hard to keep track of who is in what band and or side project and it can be frustrating when these side projects are great and they only release one album and don't tour. Case in point, Motor Sister a side project that consists of guitarist Scott Ian (Anthrax), his wife and daughter of Meat Loaf Pearl Adday, drummer John Tempesta (Exodus, Testament, White Zombie, Helmet and others), Joey Vera (Armored Saint, Fates Warning and briefly Anthrax) and guitarist/vocalist Jim Wilson (Mother Superior, Henry Rollins). The project started with a birthday party at Scott Ian’s house where he wanted to jam with and perform Mother Superior songs. Ian liked the jam session so much that he decided to try to capture the vibe from the party on to tape (or I guess hard drive now) and make an album out of it. He contacted everybody involved plus a couple of others and they all agreed instantly and were very excited to create this project. Fast forward to 2015 and the release of Ride by Motor Sister named after the Mother Superior song that is also on this album “Little Motor Sister”. I wasn't sure what to expect from this before listening since you had a mix of thrash metal guys and bluesy hard rock guys. It turns out you get a bluesy hard rock album with a touch of a thrash metal feel, who knew. From the opening riffs of A Hole all the way through this album grabs you and takes you along for the ride and just won't let go. There really isn't a bad song on the album especially if you are into bands from the late 80s, early 90’s like Mr Big, Badlands and Arc Angels this will be your cup of tea. As for the sound, it isn’t bad. This won’t be an album you show your system off with but they did a good job giving the instruments some separation. You have Scott Ian’s guitar in the right speaker, Jim Wilson’s in the left, the bass dead center along with the main vocals. The drums are all spread out nicely along the soundstage. The album sounds particularly good in a good car system, which is perfect because I think this is a great driving album. So that’s it! This album has lots of great stuff going for it, it rocks out and is an all around fun listen from beginning to end. This is one side project that I would love to see what else these guys (and girl) can do together because they make the type of music you just want to pop into the car stereo and take a drive for the whole CD. Best version to get: Right now I would say the CD because it is only available on CD and as a lossy download as I write this. There is a record release slated for May 4th 2015 and there is a chance I update this review with how the record sounds. For now, stick with the CD. Steven Wilson has been a very busy man. When he hasn't been remixing classic albums from people like Yes, Jethro Tull and Tears For Fears he has been producing albums for bands like Opeth. Well somehow he has found time in his busy schedule to write, record, mix and produce his own album of music. It's his first since 2013s The Raven That Refused to Sing (and Other stories) and his fourth as a solo artist. The album is loosely based on the story of Joyce Carol Vincent who dies in her apartment in a London and no one notices that she had been dead for 3 years. Steven explains “The basic story, or concept of the record – it's about a woman growing up, who goes to live in the city, very isolated, and she disappears one day and no one notices. There's more to it than that. Now, what's really interesting about this story is that your initial reaction when you hear a story like that is, 'Ah, little old bag lady that no one notices, no one cares about.' [Vincent] wasn't [like that]. She was young, she was popular, she was attractive, she had many friends, she had family, but for whatever reason, nobody missed her for three years.” Steven got inspired after watching the drama-documentary about her story called “Dreams of a Life”. The album is told through a female perspective and has guest vocals done by Ninet Tayeb. Like most of Steven’s most recent works he has released this in several formats, you are bound to find one that is to your liking. It is available on CD, a CD/DVD limited release, Blu-Ray, Deluxe book edition, vinyl and hi-res and lossy downloads. I think he has pretty much covered his bases here, if you can’t find a version to suit your tastes then you need to go back to the seventies and listen to your reel to reel, cassettes or 8 tracks. To really immerse yourself in this album the deluxe book edition is hands down the way to do it. He does an incredible job along with longtime art collaborator Lasse Hoile. The book really helps you better understand what is going on in the story and includes interesting details like report cards, letters, newspaper articles and lots of other fun goodies that make it almost seem like a scrapbook that this woman left behind to open up her world to you and help you really understand what she was going through. The Deluxe Edition also comes with the Blu-Ray, DVD and a bonus disc of demos. The Blu-ray and DVD also include a 5.1 mix of the album, an instrumental version and alternate versions of some of the songs as well. The Blu-ray offers all the mixes (stereo and surround) in the albums original resolution of 24/96 as well. So how is it you ask? You say will you get to your damn review of the actual music, I’ve read enough of your other crap and I just want to know how the album is? Okay here we go. The album definitely comes across as very cinematic but at times confusing. The lyrics are a bit dark, melancholy or sometimes even a little depressing but the tone of the music doesn’t always come across that way. In a way I think that is a good thing because this is heavy material being sang about and it might make for a difficult listen over and over again if the music always took the same tone. It also could be that Steven is trying to show that the woman seemed fine on the outside but when you really dug deep and really got to know her there was a lot of dark stuff going on in that head. The album is definitely a conglomeration of all of Steven’s influences kind of wrapped up into one complete album. I would say that Rush and Pink Floyd are the most obvious influences on this album because of the poppy nature of this album. It really is one of his most accessible albums to date and in some cases like the title track and Perfect Life I could easily see these being played on regular mainstream radio. But you can also hear the Emerson, Lake and Palmer, Yes and King Crimson in there too but with a modern twist. He really pulls out all the stops with the use of a Hammond B3, a Moog, electronic drums here and there and even a banjo, yes, a banjo (listen to the end of Regret#9)! Home Invasion has a great funky edge to it that really draws you in with the great B3 sound and funky bass and drums to go along. The sound on the album is, as with all of the albums Steven mixes, great. Beautiful separation and dynamic but not so much so that it looses its power. The 5.1 mixes are as usual great and I feel the best way to listen to this and most of his work. It really helps spread the music out more. The drums are actually a little more forward in the soundstage with the rhythm guitars flanking them on the left and the right and set back some. When the guitar solos come in they come in above and slightly behind the drums as does the Hammond B3. The strings for the most part are to the left and I mean just barely to the left of you. He does a great job of widening the soundstage here by putting the strings just enough into the left rear speaker so that they sound like they are coming from the far left just barely in front of you and closer in terms of front to back than everything else but about as far away because of how far over to the left they are. Harmonized vocals are spread out evenly across the front slight lower than the drums. All sounds except the reverb and delay effects seem to stay in front of you which I like, it comes across as more natural like you are front row center at his concert and you can tell where everybody is in front of you. The extras as per usual with Mr. Wilson are a real treat too. The demos are probably some of my favorites of the extras. They are pretty close to complete and I actually think I prefer the sound of the drums on these (not the performance however). They come across as more natural and less processed. The demos are a great insight to these songs and his songwriting process which includes an unused track called Key of Skeleton which really shows the influence The Beatles (especially Strawberry Fields) had on him. It has a very psychedelic feel to it. I really like some of the alternate versions of the songs as well. These can only be found on the DVD or Blu-Ray except Routine (Ninet Solo Vocal Version) and Perfect Life (Grand Union Mix) which can also be found on the iTunes version. I personally like the single edits most of all from the alternate versions but all are very good. The included instrumentals are great as well. They really let you pay attention more to what is going on musically. With an interesting, compelling story to go along with the equally enticing songwriting Steven has done a great job on his fourth solo album. The musicians gel well together and the whole album even with it’s varied musical styles and influences manages to come together nicely. I know it is early in the year yet but I am going to make a bold statement; I think this will easily be in the running for album of the year on many peoples lists. Between the very accessible music, the compelling storyline and to top it all off the very good sound quality, it is easy to see why this would be. I know this review is late to the game but I felt it was necessary to take this long to digest everything that this album had to offer. To do it any other way I think would not give it the just deserves. There is a lot to listen to between the straight album, the alternative version, the demos and the instrumental version not to mention stereo and surround sound. Each one will give you a little more to chew on and would be very hard to digest in one or two sittings. I liken it to trying to eat an entire prime rib roast and the rest of a five course meal all at once. Sometimes you need to save some for later for delicious leftovers to really truly enjoy it. If you haven’t purchased this yet what are you waiting for? It is available in your favorite format so go out and get it! Who knows, it may make you want to go out and get the rest of his back catalog of solo albums, Porcupine Tree and many of the side projects he has worked on in the past. I know it has for me. I started with his last album The Raven but although very good, it just didn’t grab me and pull me in like this album has. Best version to get: The Deluxe Edition if you can get your hands on it. It is well worth the $100. I was very hesitant since I had never heard the album before and $100 is a lot for one album but I went with my gut and I’m glad I did, you will be too. If you can’t get your hands on the deluxe edition then I would highly recommend the Blu-Ray version. If you don’t have a Blu-Ray player, get one. Even if you don’t have a surround sound system the extra versions of the album and the hi-res alone are worth the $17-$20 it will cost you plus you get a documentary on the album and photo galleries etc. It is without a doubt the best bang for your buck.